The Rookery, our charming little hotel on the edge of London’s central business district, is just five minutes’ walk from this ancient monastery, home nowadays to a group of elderly “Brothers” who live as a secular community. Tucked away behind a high perimeter wall, the Charterhouse has always been intensely private – impossible to enter, in fact. 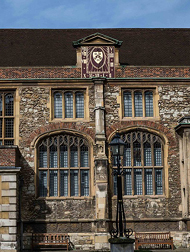 But, as of this year, you can join a discreet guided tour and discover the secrets of London’s oldest and most picturesque occupied residential building, founded in 1348 and enlarged steadily throughout the centuries. The Charterhouse is open for pre booked visits all year round. To reserve yours, just go to thecharterhouse.org. Or, if you are our guest, do ask us to arrange it all for you. For more stories like this please sign up to our newsletter though our contact form.